This girl gives her water buffalo a late morning bath in the shade. Read about our morning visit to Banteay Srey. 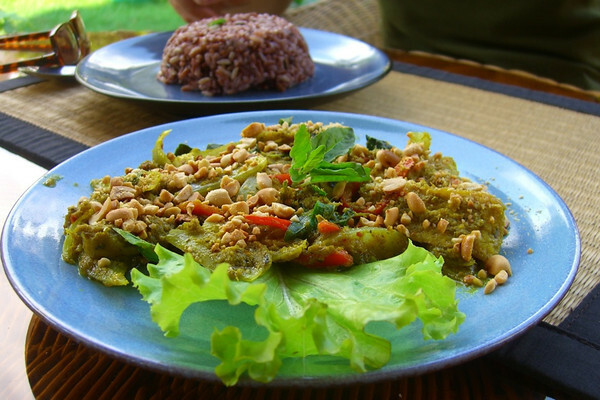 After getting our fill of Amok curry, we sampled some of Singing Tree Cafe's seafood combinations, like this one with tender pieces of fish in saffron and khmer herbs, topped with roasted peanuts and served with nutty purple sticky rice. Read about our first impressions of Siem Reap. Our tuk-tuk driver in Angkor Wat, Mr. Date, took us to his village home just south of Siem Reap. We hung out there with his family, drank coconut juice from freshly cut coconuts, and watched the kids chase the chickens. Read about our first impressions of Siem Reap. 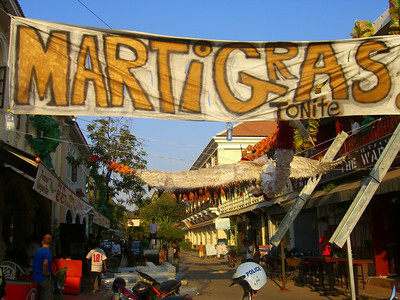 The pub street in Siem Reap decided to have a Mardi Gras celebration the Saturday following the real day. Whoever drew the banner forgot to check his dictionary and his calendar. Read about our first impressions of Siem Reap. 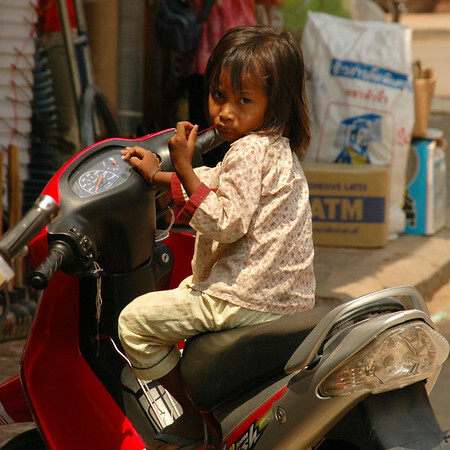 This girl waits for her mother to return from the market in Siem Reap. Read about our first impressions of Siem Reap. 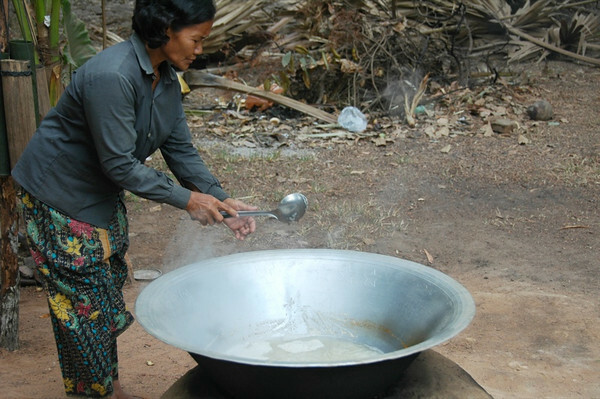 Numerous families in villages between Siem Reap and Banteay Srei focus their morning efforts on boiling down the juice from palm fruit to make palm sugar candies and compressed squares used in cooking. Read about our morning visit to Banteay Srey. 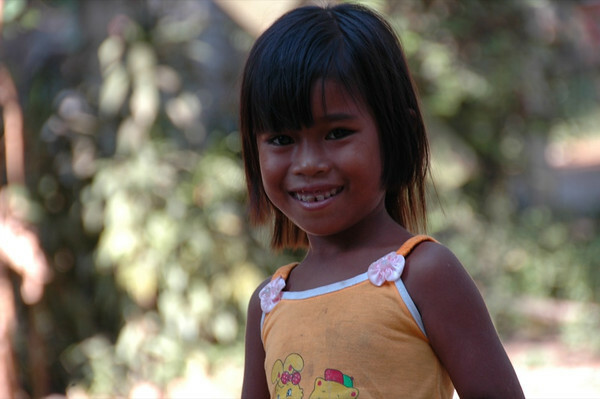 Located near the main market in Siem Reap, this small Friends International street kids center serves as a place that street kids can come to learn, play, paint and just have a break from the street. Most of the kids are scavengers, rummaging through garbage to find salable bits. We came across this place thanks to a sign posted outside announcing a photography exhibition by street kids. The stories of these kids were heartbreaking - abuse and alcoholism span cultures and countries, unfortunately. 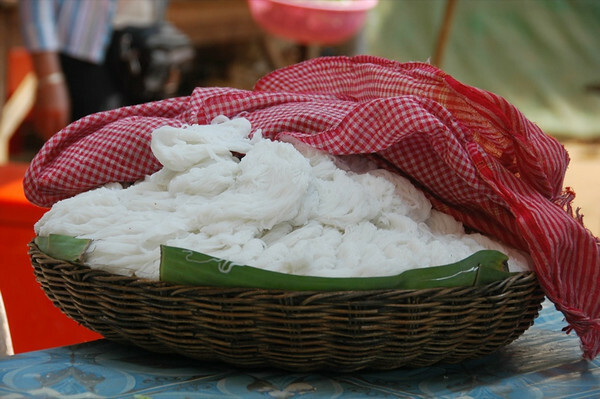 Read about the other side of Siem Reap. 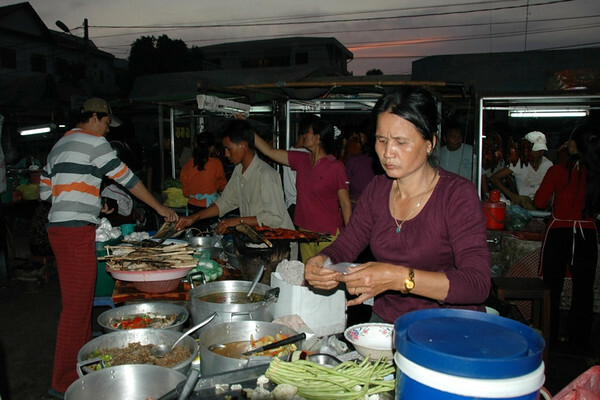 Most of Siem Reap is filled with restaurants, hotels, spas and other services geared towards foreign tourists. There is another side to life here, however. 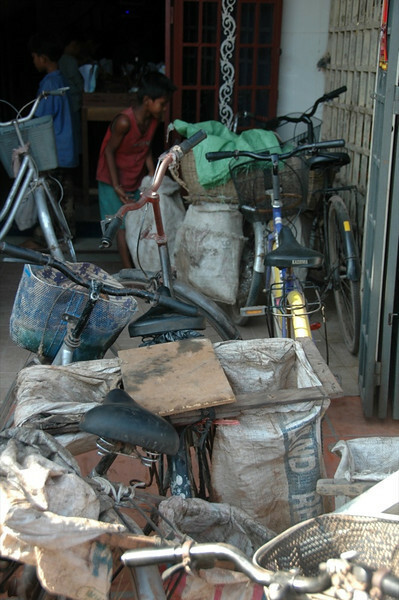 These kids have outfitted their bicycles with bags to collect garbage that they hope to sell later. These kids were leaving the Siem Reap Street Children Center after watching cartoons and an educational video on the dangers of sniffing glue (which is unfortunately quite common here as well). 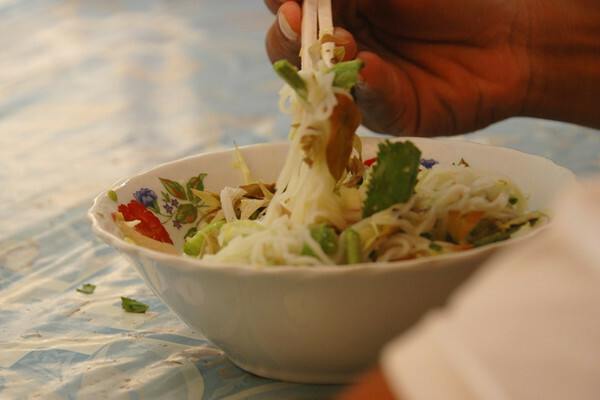 Read about the other side of Siem Reap. A mother and son stand behind a palm sugar basket in a village between Banteay Srei and Siem Reap. Read about our morning visit to Banteay Srey. Located near the main market in Siem Reap, this small Friends International center serves as a place where street kids can come to learn, play, paint and just have a break from the street. Most of the kids are scavengers, rummaging through garbage to find salable bits. We came across this place thanks to a sign posted outside announcing a photography exhibition by street kids. The stories of these kids were heartbreaking - abuse and alcoholism span cultures and countries, unfortunately. 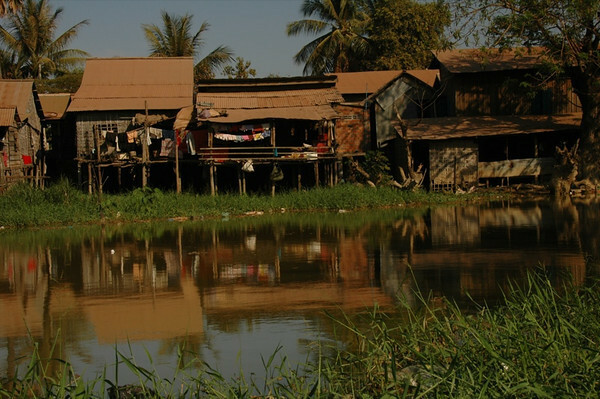 Read about the other side of Siem Reap. 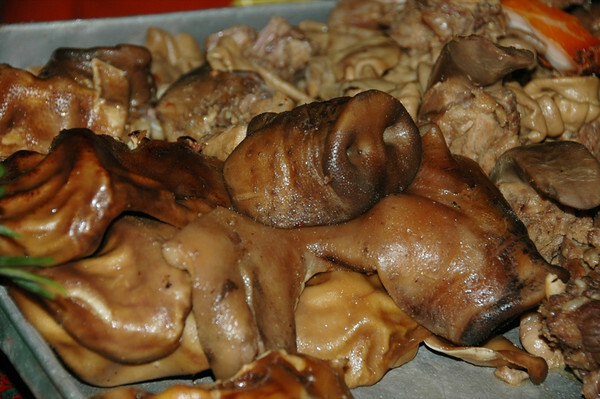 A tray full of smoked pig snouts and other bits on a side street behind the main market. Read about our first impressions of Siem Reap. As soon as you begin to exit Siem Reap, spiffy becomes scruffy and real life is revealed, as it is here along the Stung Siem Reap. Read about our first impressions of Siem Reap. Read about our first impressions of Siem Reap. This girl, curious and shy, approached us from the neighbor's yard. 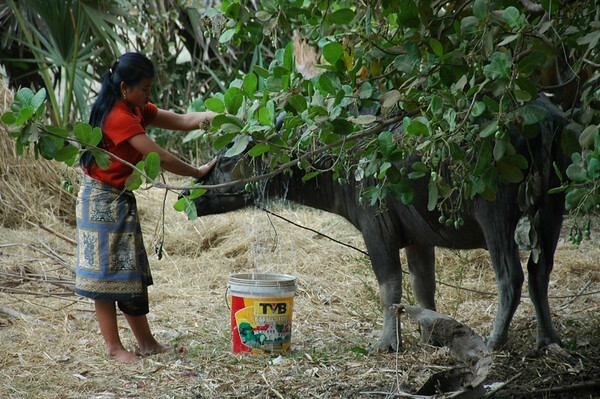 Though tourism in Cambodia is growing, tourists are still a novelty in many small villages. Read about our first impressions of Siem Reap. Doesn't look like a lake, does it? During the dry season, the Tonle Sap Lake shrinks tremendously, leaving land exposed for dry rice farming. In the wet season, this area is again swallowed whole by the lake's advance. Read about our first impressions of Siem Reap. 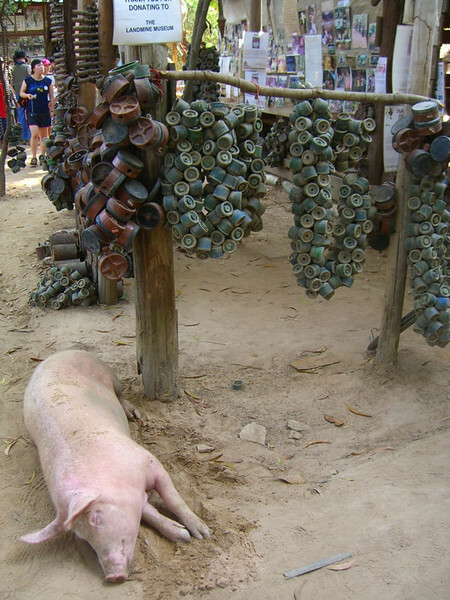 This pig provided comic relief at the sobering Land Mine Museum in Siem Reap. The Land Mine Museum (www.cambodialandminemuseum.org) is located off a small dirt road between Siem Reap and the entrance to the Angkor Wat complex. It's a series of small huts and exhibitions with examples of deactivated land mines strewn all over. The museum was started by and is run by Aki Ra, a former child soldier for both the Khmer Rouge and the Vietnamese Army. As a child soldier, he laid the mines. As an adult, his mission is to rid Cambodia of them and assist land mine victims in making lives for themselves. He and his de-mining teams continue to uncover land mines with shovels and sticks. 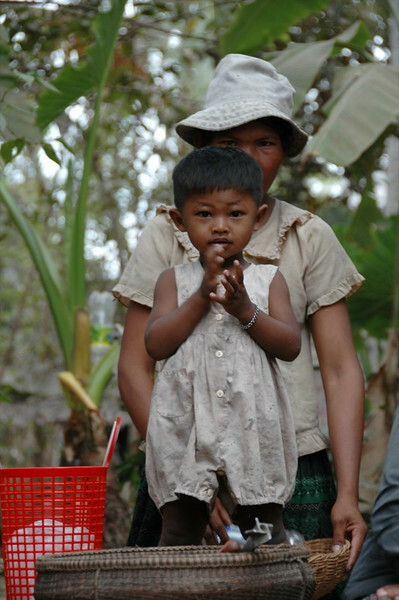 Unfortunately, there are still millions of unexploded land mines in the further reaches of Cambodia. 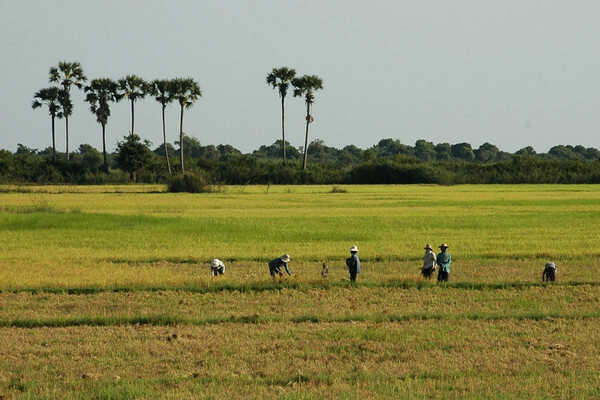 Read about the other side of Siem Reap. 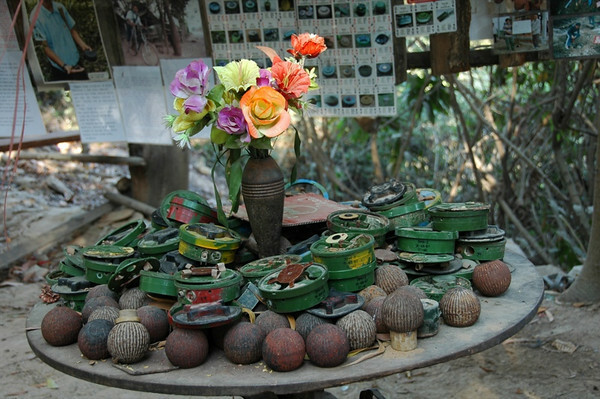 A curious arrangement of de-activated mines, ordnance, and plastic flowers at the Land Mine Museum in Siem Reap. 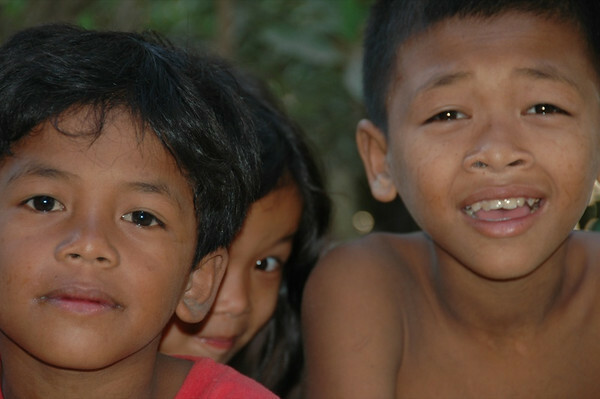 Read about the other side of Siem Reap.